SIGNED and Numbered Elliott Erwitt. Limited Deluxe Edition with SIGNED and Numbered Print. With the Clam Shell Case. Texts by Murray Sayle and Charles Flowers. 11 x 7.75 inches. Deluxe Limited edition of 250 SIGNED and numbered copies. 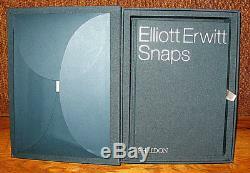 SIGNED and numbered by Elliott Erwitt on an insert laid into the book. Accompanied by a SIGNED and numbered silver gelatin print, Marilyn Monroe, New York, 1956. Clothbound with silver stamped title. Deluxe edition housed in oversized matching cloth clam shell case. With the print, in its own case, affixed to inner cover. Very good in a very good case with a very good plus print. Rare among photographers, Erwitt can make you laugh out loud, just turn to pages 8687, but his scope is Tolstoyan. This 550-page retrospective will absorb you for years. The first comprehensive monograph covering the complete career of Elliott Erwitt b. 1928, one of the leading photographers of his generation, and an influential member of the Magnum photographic agency since 1954 Offers a snapshot of the famous and the ordinary, the strange and the amusing over a 50-year period, through the lens of one of the period's finest image makers Contains over 200 previously unpublished photographs to reveal the extent of Erwitt's prolific photographic output Includes images of places, things, people and animals all over the globe, captured in Erwitt's unmistakable, often witty, style. Light wear to the book. 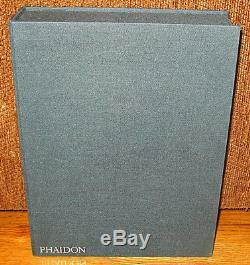 Internally, a Phaidon non-mint stamp on the title page. The print is perfect and comes with his own tissue guard, housed in its own folder which is affixed to the inside front cover of the book. The claim shell case also has light wear. Small ding to the top edge back cover. SIGNED and numbered Elliott Erwitt. 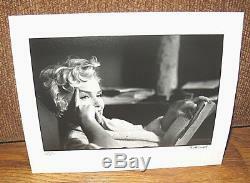 With a signed and numbered Marilyn Monroe New York, 1956 print. 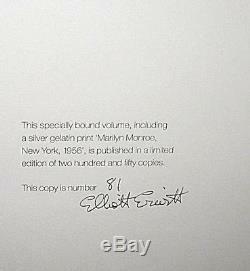 The item "SIGNED Numbered Elliott Erwitt Snaps + Marilyn Monroe NY Silver Gelatin Print" is in sale since Tuesday, September 5, 2017. This item is in the category "Books\Antiquarian & Collectible".